An LDS stake president in Sandy did something in a speech earlier this month that other Mormon leaders have done many times: He warned that evil is corrupting the world. Full text of President Matthew DeVisser’s talk is here. Not surprisingly it’s also gone viral on conservative/religious websites, particular Mormon ones. Setting aside for the moment that statement is simply false (meaning that is is a lie)–it was one of the loudest most politically charged GOP talking points of the entire election. Several political posts from a variety of political websites confirm this GOP talking point: Talking Points Memo; Media Matters; The Hill; Huffington Post. President Uchtdorf was born on November 6, 1940, in then Mährisch-Ostrau, Czechoslovakia, to Karl Albert and Hildegard Else Opelt Uchtdorf. He was raised in Zwickau, Germany, where his family joined the Church in 1947. If President Obama is an evil socialist, by any measure of the socialist standard, Germany–and all other European countries–are far more socialist in their education, health care, and welfare policies toward their citizens. Participating in, electing, and supporting such policies taints and/or has tainted President Uchtdorf as well as all other Latter-day Saints across the European continent, including Great Britain. One has to wonder whether the same “spirit” would have prompted President DeVisser to give the same address over the pulpit in a Stake Conference to our European Sisters and Brothers? Mitt Romney, the GOP Presidential Candidate and his would be competitors made this exact same point throughout the last presidential election, deriding Europe and Britain as socialist, over and over. See here and here. Holding and even promoting such political views in the public square is the absolute right of every American, even Mormon Stake Presidents (or former Stake Presidents, as is Mitt Romney); however, wrapping them in the cloak of sacred theology, characterizing them as impressions of the “Holy Ghost” and delivering them over the pulpit in a Stake Conference in your capacity as a Stake President is inexcusable, indefensible, and so far removed from a Stake President’s calling as to border on blasphemy. It demeans and pollutes the concept of personal and official inspiration and revelation (The Rock upon which the Church is founded) and to which individual Mormons and Stake Presidents are entitled. God (and by extension His Son, Jesus Christ) does not involve Himself in the day to day political polemics of American elections. Mormon Stake presidents should know better–and fortunately most do. It remains a mystery to me how some of my Mormon sisters and brothers hold views similar to that of President DeVisser. I mean, what screams “capitalism” and “free enterprise” louder than say a critical reading of the Sermon on the Mount here, here, and here. Or the building of a near Zion like society by the Nephites in 4th Nephi. I don’t speak in any official capacity for anybody on this blog. “The Brethren” don’t seek my opinions on anything political or theological (probably with very good reason). But, my own view is that Stake President Matthew DeVisser has far exceeded the appropriate bounds of wedding Church and State in the Mormon Church in his Stake Conference address. I also believe the best way to address this wrong is for him to apologize publicly over the pulpit, to every ward in his stake, pointing out his mistake, and admitting he should never have mixed GOP political talking points as part of a Stake President’s address during a Stake Conference. Reason #4375 why I will never live in Utah. This is an absoluet abuse of power. I’m not certain the problem is unique to UT. My guess is that there are many, many American Mormons all over the country (including a good number of stake presidents) who hold these views. Perhaps it’s just more pronounced there–I don’t know. Regardless, it had no place at a stake conference. It happens in Texas also. The Sunday I gave my home coming talk upon returning from my mission, a relative of mine spoke on the importance of voting for George W. Bush and why Al Gore was not a suitable candidate. I was pretty embarrassed. With good reason. I suspect Texas given it’s extraordinary conservative makeup would be a natural place for this to occur as well . . . I am sickened by this news coming from the pulpit of a stake conference, I live here and really wish this state was more more civilized and educated. I agree ” borders on blasphemy” using the Holy Ghost as an excuse for being so hateful. This infuriated me to hear his rhetoric coming from the pulpit and using his position as Stake President is way out of bounds. He should be censured by the First Presidency, but nothing will happen. His reference to being directed by the Holy Ghost is disgusting. If the Holy Ghost wanted Mormons or anyone to hear this message it would not have come “through” DeVisser. Get real President DeVisser !!! !– you do not deserve to have the mantle of leadership you have. It’s a joke !!! Well–there may not be an censure as you suggest; however, there has been a fair amount of negative publicity, which may give him pause before undertaking more of the political pulpit . . . Watching the kind of overreaction this talk has stirred up is so much more entertaining than the substance of the talk itself. I love Peggy’s coverage, it belongs right alongside the SLTrib’s regular denouncement of polygamy. Contrary to your hysterical response, I think the stake president in question is massively harmless, he said nothing that should have provoked any such ridiculous degree of posturing outrage from hypersensitive thin-skinned mormon liberals. Along with their beloved President Obama, the “progressive” camp can’t seem to get much beyond campaign mode. Your allusions to LDS that happen to live in places with socialist governments is quite a strenuous exercise. I hope someday you will get an opportunity to share your honest views with Elder Uchtdorf. You might learn a few interesting things regarding his personal views on socialism. As for Mitt Romney, will you ever be able to complete a paragraph, in the rest of your life, without besmirching him? And this innocent stake president! Wouldn’t you just love to have a personal, face to face meeting, with these men you presume to invest such energy in denouncing? Doesn’t matter to me Jim, what President DeVisser’s political views are–it only matters to me where he expresses them, and then only one place is inappropriate–over the pulpit in a Church meeting. Otherwise, he can believe and expound whatever political ideology he wants . . . Thanks, Guy. I guess I can read about what really matters to you! Then too, it appears to me that the stake president cares a lot less about defining the finer nuance of political categorization, and perhaps is more concerned about simpler principles — little things like the truth. Ah, well. What do I know? Seems to me that some folks are missing the larger point that as a Stake President (I served as one for 11 years) his primary responsibility is to invite and encourage people to “Come Unto Christ” and preach the foundational principles of the Restored Gospel of Jesus Christ. I’m not sure whether he ever got around to that in his remarks. I am almost certain, however, that even if he did, there were some of those in attendance who did not hear of listen because they had been offended by his political comments. During my years of service I made it a point to avoid saying anything, even in humor, that might cause anyone to turn a deaf ear to my testimony of the Gospel, and the principles inherent in getting and living it. A fundamental charge of any Priesthood Leader is to “protect the pulpit” over which he has stewardship from anything that would diminish the prime purpose of that station. If long after he presided over a sacred responsibility of the Saints to “gather in conference,” his members are talking and thinking only about hs political comments, then it appears to me that this might be an example of a leader who failed in that responsibility. Joel–thanks for sharing your thoughts, particularly from your perspective as a former stake president. I agree that the larger point is for leaders such as stake presidents to focus on inviting and encouraging people to come to Christ. We all share that charge to one degree or another; however, a stake president even more so. Thanks for stopping by . . . Thank you for this response. It was what I needed to hear. This is my first time on this site & it was refreshing to read what I felt. Thank you. Joel, I suspect you are right. But the plain fact of the matter is, few of those in the congregation when the address was given were likely even awake for the whole talk. Certainly none of them would have been likely to attach as much importance to it as the standard liberal outraged hue-and-cry that has been raised. Perhaps we can request that the offending stake president report on just how many have left the fold because his talk offended them. I disagree. I believe the best way for him to go forward would be to do what he should have done in the first place, start preaching those same political talking points from the book, The Teachings of Ezra Taft Benson. Of course, you and Peggy would still be upset, but it would be a lot more difficult to accuse him of speaking inappropriately. One week ago today, a speaker in our stake conference did an excellent job of reviewing Marion G. Romney’s talk, “The Celestial Nature of Self Reliance,” found in the March 2009 Ensign. 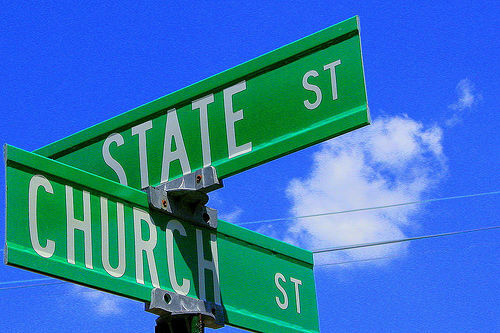 I think it becomes difficult, if you quote the right sources, to say where the line really is between church and state in the LDS Church. Gary–I didn’t create the political neutrality policy, The Church did. And, it’s a good one. Ezra Taft Benson preaching politics from the pulpit is no more appropriate than President DeVisser. It would likewise be inappropriate for me to get up in a sacrament meeting and rehearse a list of democratic talking points over the pulpit. It’s that simple . . .
I’d enjoy hearing that. Please send an invite this way! RE: Pat Bagley’s article as linked above. That sentence contains just enough of Benson’s words to deceive Bagley’s readers. But that is NOT what Ezra Taft Benson said. Yet Bagley twisted Benson’s answer into an endorsement of one party over the other. It would be a lot more “timely” if it were true. Had DeVisser confined his remarks to The Teachings of Ezra Taft Benson, a lot of liberals would have been indignant anyway, but we wouldn’t be having this conversation. Having interacted with many “conservative Mormons” both in UT and outside of UT, there is a general consensus that any democrat is a liberal democrat. It’s a distinction without a difference. And, it doesn’t matter whether the remarks were created by the stake president of a former president of the Church. They are inappropriate from the pulpit. It’s one reason we don’t hear these same kinds of comments that were much more common in Ezra Taft Benson’s day. . .
Again, I think politics are best discussed away from the pulpit. Leave it to Facebook, or to blogs . . . I am delighted by his remarks, and the fact that nothing will happen about his having made them. It illustrates what I have always said: There is no difference between the Mormon Church and the far right and corporate values of the Republican Party, which is rapidly becoming more and more politically irrelevant. I hope he and others keep it up, thus guaranteeing the demise of the Republican Party. Don–I’m part of the “Mormon Church”–however small. And, I can tell you there’s no wider gulf than that, between me and the far right corporate values of the GOP–which I agree is (The GOP) becoming more politically irrelevant. Broad generalizations (generally speaking) are just not very enlightening . . .
You are right Guy. I simply can’t argue with your point. Did anyone watch the recent Day of Prayer breakfast/conference held recenty in Washington, DC? President and Michelle Obama, VP Biden and others were present. The key note speaker was Dr .Benjamin Carson, a Pediatric Neurosurgeon. He spoke about many current topics. He mentioned how political correctness is destroying America. We have to speak up before freedom of speech is revoked. President Obama listened intently to Dr. Carson. I suggest you do the same. You want me (us) others to listen intently to Dr. Carson? What exactly is the point you are making? Based on what!? Based on the limited view of one man’s interaction with conservative Mormons. But Benson did did make the distinction and scolded “both political parties” for harboring liberal philosophies. It is dishonest to claim, as Bagley did, that Benson thought you couldn’t be a good Democrat and a good Mormon. Let me give you an example of one who is a good Democrat and a good Mormon. Guy, my friend, not all Democrats support gay rights and abortion. Marlin K. Jensen is a Democrat who opposes both. In 1974, Benson did NOT say “it would be difficult to be a devout Mormon and Democrat at the same time.” Benson spoke of liberal Democrats, not all Democrats. And it is clearly a valid distinction. That 1998 interview with Marlin K. Jensen apparently does not represent his current feelings about the Churches’ stand on Gay issues. He has publicly addressed this often in the last couple of years and apparently he has become much more empathetic of deserving equality. You are right that not all Democrats support abortion. I think that most LDS Democrats do support the LDS concept of “free agency” over any support of abortion and the two should not be misrepresented or misconstrued, especially for the purpose of driving a political wedge. I fail to see how your acerbic and sarcastic comments contribute to this dialogue–they seem to portray an intellectual inability to converse constructively to the main issue here–should DeVisser have made those political comments from the pulpit in his position as Stake President. And then to justify them by saying he was inspired by the Holy Ghost to go as far as he did in parroting conservative talking points using their verbatim phrases. To me that is where he was inspired more by Rush Limbaugh than the Holy Spirit. I would hope any church member would find his actions out of bounds and divisive as well as beneath our expectations of his position. I can’t defend those words or actions in that setting and it is fair to discuss that without name calling and insults leveled at anyone who disagrees with your point of view. Please show more intellectual integrity. You’re suggesting perhaps he never gave this talk? Don’t you think if that were the case folks who attended the conference would be making that claim? Yep–still hearing the same clap trap today . . . If the stake president was a liberal and said stuff about the republicans you could bet money that the conservative members would snarl and gnash their teeth. It is laughable that thin skinned conservatives think moderates and liberals are thin skinned. Politics.are.not.to.be.spoken.over.the.pulpit. I live in a conservative town and I am always reminding the members that politics are not for church lessons or talks because someone always brings politics up in church. I am not well liked but I don’t care. I am a conservative Democrat AND a faithful member in good standing. On another blog someone said all members who are Democrats are not worthy to hold Temple recommends or leadership positions, and members should be asked what party they belong to so recommends could be withheld from the Democrat members. It never ceases to amaze me how un-Christ like and mean members are to one another and it is because the majority of the members do not truly believe and do not truly live the gospel principles. Yeah, pretty amazing for sure . . .
Where’s the outrage about this? Do some feel that being suspected of a crime suspends the need for Police to follow the Constitution? It is possible to surely call at your competence in the function you’re writing. A area desires much more excited freelance writers just like you who are not reluctant to mention how they believe that. On a regular basis follow a person’s heart.